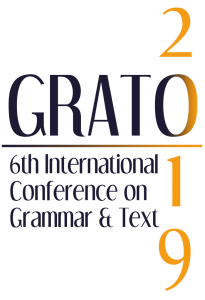 The Grammar & Text Group of Linguistics Research Centre of the Universidade NOVA de Lisboa (CLUNL) is pleased to announce that GRATO 2019 – 6th International Conference on Grammar and Text – will take place on 14-16 November 2019 at NOVA FCSH School of Social Sciences and Humanities of the Universidade NOVA de Lisboa, Avenida de Berna, 26 C, 1069-061, Lisboa, Portugal. GRATO – International Conference on Grammar and Text – is a biennial conference that brings together linguists from diverse theoretical backgrounds to discuss topics on morphology, semantics, text theory and discourse analysis, aiming to connect and thus mutually enhance grammatical and text / discourse approaches to language, from synchronic and diachronic perspectives. In this context, the Grammar & Text Group invites to the submission of abstracts for oral presentation until April 30, 2019. Abstracts are invited for 20 minute presentations (followed by 10 minutes of discussion). Abstracts must not exceed 500 words, including examples and references (12 pt font). Submission is limited to one single‐authored and one co‐authored abstract per author, or two coauthored abstracts. The working languages of the conference are Portuguese, English, Spanish and French. Abstracts (PDF) should be sent in two versions, one anonymous, and one with the author’s name and affiliation. © 2019 CLUNL - Centro de Linguística da Universidade NOVA de Lisboa. All rights reserved.